“Being a smaller venue, visitors sit close to the stage/screen. This makes the improved resolution really obvious." Challenge: To show live broadcasts from the Royal Shakespeare Company and the National Theatre Spotlight Theatre, Bridlington needed to upgrade its old projector to meet strict guidelines. Solution: Spotlight installed the Optoma ProScene EH7700 with a short throw lens which boasts a brightness of 7,000 ANSI lumens and incorporates BrilliantColor™ technology to produce stunningly bright images with perfectly balanced, lifelike colours. Spotlight Theatre in Bridlington wanted to extend its programme of performances to show live broadcasts from the Royal Shakespeare Company (RSC) and the National Theatre (NT). 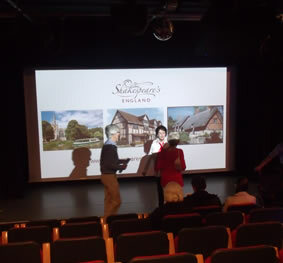 In order to do this it had to upgrade its existing projector to meet the technical requirements stipulated by RSC and NT. To be eligible to broadcast these performances, theatres and cinemas must have a projector that is a Full HD resolution of 1920x1080, capable of displaying 50i 16x9 image format with no less than 7,000 lumens brightness. They must also have satellite equipment capable of outputting this format, including digital 5.1 and stereo sound. Spotlight Theatre is home to the Bridlington Amateur Operatic and Dramatic Society (BAODS). BAODS performed its first production in 1909 and staged performances across a range of venues throughout the 20th Century. It wasn’t until 2000 that it bought its own space - Spotlight Theatre. This former print works on West Street is Bridlington’s very own bit of Theatreland. In the last 15 years this intimate little theatre has gone from strength to strength. Alongside its talented amateur company, professional touring shows perform to enthusiastic audiences all year round. It offers a varied programme of events including music gigs, dramas, full-blown musicals and its popular annual panto. The live streamed performances would be a fantastic addition to this programme. After researching options, Spotlight chose the Optoma ProScene EH7700 with a short throw lens. 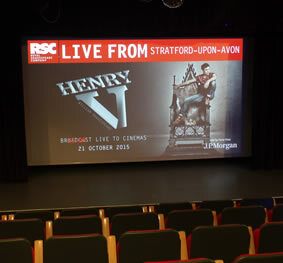 It installed the AV equipment needed to stream the live performances as part of a wider refurbishment, which included comfy new seats and a four-metre wide electric screen. 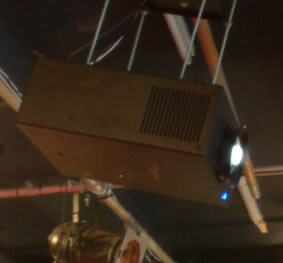 The full WUXGA (1920 x 1200) resolution EH7700 projector boasts a brightness of 7,000 ANSI lumens. It incorporates BrilliantColor™ technology to produce stunningly bright images with perfectly balanced, lifelike colours. ProScene projectors are engineered for reliability. The dust-sealed, filter free design prevents dust and dirt from affecting the system ensuring optimal image quality with minimal maintenance. It features DLP® technology pioneered by Texas Instruments, which uses millions of mirrors to produce higher quality imagery which does not suffer colour degradation over time, as sometimes experienced in other projector technologies. The projector can be managed and monitored remotely with Crestron RoomView®, Extron IP Link, AMX and PJ-Link, which allow almost all aspects to be controlled across a network. It has extensive connectivity supporting a wide number of computer and video inputs including VGA and two HDMI ports. The projector’s five motorised lens options and its ability for 360˚ operation guarantees flexibility in installation. The step-up in performance from the EH7700 made an instant and obvious impact with its increased resolution and brightness. Mike Sheldon, Chairman of Spotlight Theatre, said: “Being a smaller venue, visitors sit close to the stage/screen. This makes the improved resolution really obvious. Throughout September, Spotlight is showing Othello, The Beaux Stratagem, The Crucible, AIDA, Battle of Britain, Showboat, Coriolanus and the ballet Romeo & Juliet from NT’s Live programme. It is also live streaming from The Royal Opera House, Sydney Opera House and San Francisco Opera House – bringing these amazing performances from across the world to the people of Bridlington. Spotlight’s winter programme includes the Carlton Colliers, Beryl, Dracula, Secret World of Charles Dickens, music from Howard Beaumont and Roger Maughan, Scrooge, its popular annual pantomime and Farmer Scrooge's (Yorkshire) Christmas Carol. Mike said: “Having the retractable screen is really useful. It allows us the flexibility to use the whole stage for theatrical performances while having the screen down for the live streamed performances. “We are also using the projector now more within the theatre productions themselves and as an advertising vehicle for upcoming performances while the audience is waiting for a show to begin. It is a fantastic piece of kit and has made a real difference to us. Tickets for all shows are available one month before the production date from Bridlington Blinds & Curtains, Bridge Street, Bridlington or by calling 01262 601 006.